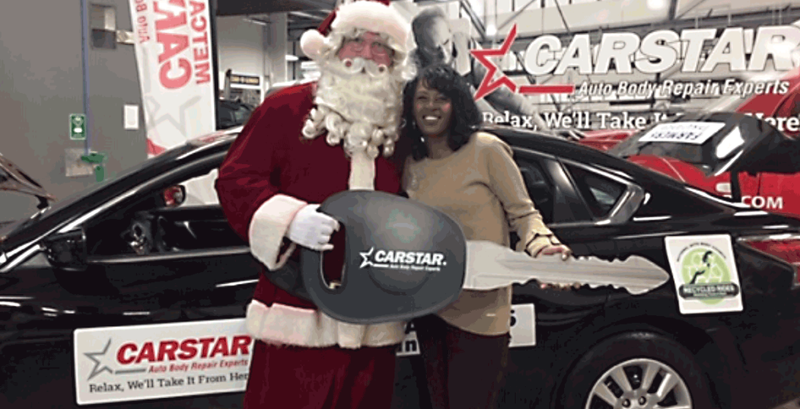 A veteran from Kansas City, MO, received an early Christmas gift when Santa awarded her keys to a 2015 Nissan Altima 2.5 at a ceremony on Wednesday, December 5, at the CARSTAR Metcalf facility in Stilwell, KS. Karen Carter Veal was chosen by Veterans Community Project (VCP) in Kansas City. Veal lives in “Veterans Village,” which is a community of tiny homes built by the VCP as transitional living for homeless veterans. Veal currently shares a car with her son. The Coast Guard veteran needed her own transportation to become more independent. “This car will be a blessing to two families a million times over,” said Josh Henges, clinical director at Veterans Community Project. Veal is currently employed and plans to start school to learn medical coding next fall. The veteran was chosen to receive a NABC Recycled Rides™ vehicle from CARSTAR Metcalf Auto Body. NABC Recycled Rides™ is a community service program of the National Auto Body Council where body shops repair and donate vehicles to agencies and families in need. The Nissan was donated by Farmers Insurance®. The vehicle had been damaged due to a collision but had less than 30,000 miles. Technicians at CARSTAR Metcalf volunteered their skills to repair and refurbish the car. Employees at the Farmers Olathe, KS office also donated some “extras” to the veteran during the holiday season. Additional gifts included gift cards that can be used for clothing, a car seat for her grandson and car-related items. Many other businesses and organizations donated to make this car giveaway possible, including LKQ Mid-America, Auto Detailing, Charity Cars and the National Auto Body Council.